The ‘culture of dialogue’ in Cambodian politics already appears to be history. An excellent article in this month’s Foreign Affairs, by Stephanie Giry, outlines the strategies Cambodian Prime Minister Hun Sen has used to stay in power. 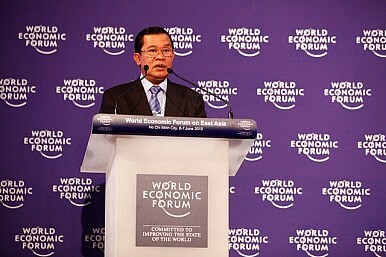 Now the longest-serving nonroyal ruler in Asia and the seventh-longest serving nonroyal ruler in the world, Hun Sen remains the ultimate survivor. He is a man who was one of the youngest foreign ministers in the world in the period after 1979, when he served in the government installed in Phnom Penh after Vietnam invaded and removed the Khmer Rouge. He was a former military man who made a gradual transition from the unschooled, rugged but naturally savvy former fighter from that time to a suave and charming head of government. For three decades, according to human rights groups, Hun Sen has used a combination of populist charm, control of the media through relations with media tycoons, outright intimidation, and relatively effective management of the economy to stay in power. Cambodia holds elections, but the deck tends to be stacked heavily against the opposition, with TV networks, the election commission, and other critical actors historically favoring the ruling party. In 2013, after his party, the Cambodian People’s Party (CPP), suffered a shock setback in national elections, nearly losing control of parliament to the opposition, Hun Sen appeared more conciliatory toward the opposition. Despite its virtual control of all broadcast media, Hun Sen and the CPP now faced a major challenge from young, urban Cambodians who could organize through social media and the Internet, and did not have the loyalty to the CPP that their parents and grandparents displayed. For many of these young Cambodians, Hun Sen’s basic promise of a rough kind of stability, after the destruction of the Khmer Rouge era, was not enough to vote for the CPP. In the wake of the opposition’s strong election showing, Hun Sen and opposition leader Sam Rainsy embraced each other and agreed to foster a “culture of dialogue” that, in Cambodia’s often-brutal politics, had been lacking in the past. Hun Sen allowed the opposition to get a license to run its own television station; terrestrial broadcast media had been dominated by stations that were pro-Hun Sen and pro-CPP, according to multiple human rights groups. The opposition halted its boycott of parliament and the two sides agreed to create a new election commission, which supposedly would be more impartial than its predecessor in overseeing the next national elections in 2018. Last year, some Cambodian observers speculated that Hun Sen would soon retire, and would not stand for prime minister in the 2018 elections. The culture of dialogue appears, already, to be history. Although Rainsy has not returned to openly bashing Hun Sen, the opposition and the government are doing battle, Cambodia-style, once again. In July, authorities jailed eleven opposition activists on charges of “insurrection” that could net them as much as twenty years in jail. In August, the government charged an opposition senator with treason for supposedly posting a diplomatic document related to the Vietnam-Cambodia border online. The government this year is debating or has passed new legislation that might neuter unions and nongovernmental organizations as well, by reducing the number of union members needed to dissolve a union and by allowing the state to potentially prosecute nonprofits on vague charges of undermining national security, national unity, peace, and Cambodian culture. Despite a new boycott of parliament by the opposition, the government passed the new law on nonprofits this summer. The law also may restrict international NGOs, some of which have had contentious relations with Hun Sen in the past. Under the new legislation, international NGOs and domestic NGOs both must register with the government, even if they are only conducting short-term projects in Cambodia. Cambodia’s armed forces belong to the country’s ruling party and must prevent a ‘color revolution’ from overtaking the Southeast Asian nation, a four-star general said. Many parts of the armed forces, in fact, operate almost like private militias, according to a recent article in The Diplomat; they are funded by major Cambodian businesspeople, many of whom have close links with the CPP. Little hope left, indeed, for the culture of dialogue in Phnom Penh. Why Did Cambodia's Opposition Leader Quit?Cambodia’s Opposition Leader Delays Return Home Amid Arrest FearsUncertainty and Pressure: Cambodia Under the Weight of SanctionsCambodia’s Domestic Politics in the Spotlight at the United NationsWhat Do Prisoner Releases Mean in Hun Sen’s Cambodia?